Hotel Lancelot, which is just 1 km away from Arrecife’s city centre, is strategically located for those wanting to visit Lanzarote island’s prominent attractions. Established as far back as 1968 and renovated in 2004, this hotel offers an outstanding number of rooms, as many as 110. Those with young children or couples may want to choose one of the hotel’s 77 double rooms. Singles or even couples can select one of its 33 single rooms, which are spacious enough for two. To sample different international dishes, visit its wonderful restaurant. For a lovely panoramic view of the city and the beautiful sea, go up to the hotel’s rooftop terrace. To maintain your fitness, make good use of the hotel’s fitness and swimming pool. 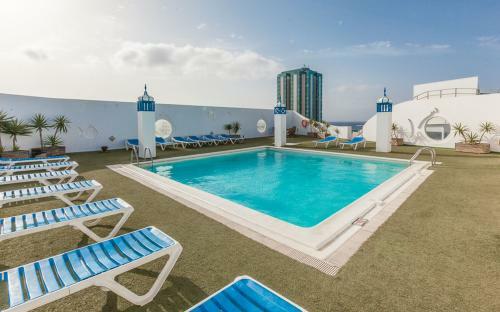 Located just five minutes away from Arrecife Airport, which is Lanzarote’s main airport, the hotel is also close to various popular attractions. Among them are Charco de San Ginés, natural seawater lagoon, which is in the very heart of city and the eighteenth century Castillo de San José. Today, the castle houses a great collection of contemporary art covering various kinetic, abstract and other types of art forms. To make the stay convenient for businessmen, the hotel offers a conference room, photocopying facility and a business centre. Hotel facilities also include a game room, a sun terrace, beach towels, beach umbrellas, chaise lounges and beach chairs for those who wish to enjoy the sun or have some fun. Every room has common amenities such as Wi-Fi, air-conditioning, a satellite or cable TV, a magnifying mirror and a hair dryer. Other benefits include a balcony, safe deposit box, an alarm clock and a mini bar. Has an elevator on the street level that is great an parking for clients free for 15 minutes. Good price for good location, side and cleanest of the room, and lunch. The orange juice was terrible. Difícil aparcar en la zona, pero tienen dos plazas a la puerta para descargar maletas. Ubicado próximo a la salida al aeropuerto, y enfrente de la playa, pero la zona de la ciudad deja bastante que desear (más los fines de semana). La ubicación, enfrente de la playa del reducto, playa tranquila, sin olas por la barrera natural de lava. Zona muy tranquila. La piscina está genial en la azotea. La comida es buena, sobre todo la cena. La ubicación del hotel es muy buena. Primera linea de playa y personal educado. Nos dejaron hacer el check in una hora antes para poder tener donde cambiarnos. Trato muy amable.